Little Family Fun: Rainbow Run! I'm always trying to come up with energetic activities that LB(3) will enjoy, and that will burn some of his endless energy! 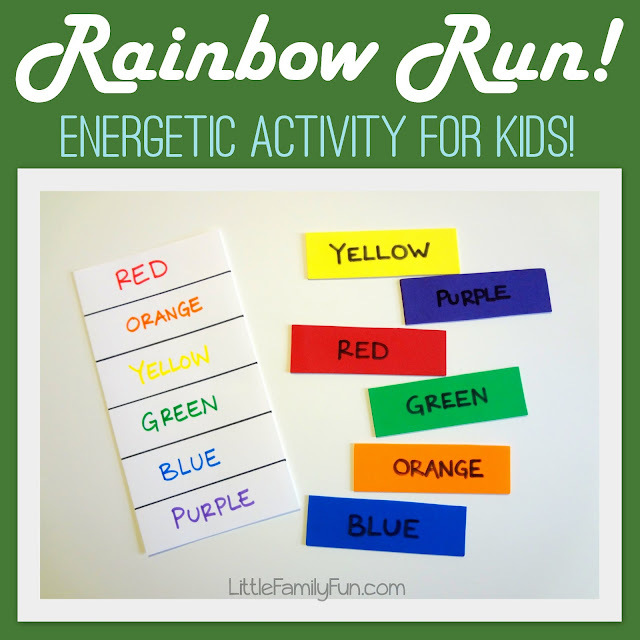 He had a blast with this super simple Rainbow activity! 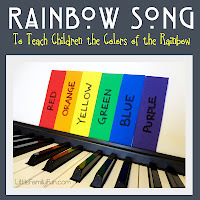 Cut out strips of craft foam OR construction paper in each of the 6 basic colors of the rainbow. (Mine are about 1 3/4" wide and 6" long). Using a black permanent marker, write the name of each color on the strips. Cut a piece of white paper or cardstock so it's 6" x 11"
Using one of the color strips, draw black lines on the white paper so there's a place for each of the strips. Write the names of the colors in each box--using corresponding colored markers. Lay out all the color strips on the kitchen table, and place the white paper in the living room. Have your child sit on the couch and wait for you to say a color. Then they get up and run as fast as they can to go find that color on the table, and bring it back. Then they place it on the correct spot on the white paper and sit back down on the couch to wait for the next color. Then we started all over again! LOVE THIS! My boy is 8 and has delays. You can do so much with this. Numbers, sight words, so on! Thank-you for sharing!